A wacipi — powwow — is a Native American gathering focused on dance, song and family celebration. Powwows celebrate the connections to tradition and spirituality, to the Earth and to one another in a social, personal and spiritual meeting. Powwows began mainly as religious ceremonies to gain wisdom from and give thanks to Wakan Tanka — Great Spirit. Though many of today’s powwows have evolved into social and contest-oriented dances, religious and ceremonial dances are still performed. The “Gathering of the Wakanyeza” is a contest-oriented dance. Our goal is to celebrate each other, especially the wakanyeza — little beings! Though the dance styles and content have changed, the meaning and importance of the dance has not. No other event captures the Native American spirit like the powwow. Dancers in colorful regalia gracefully move around the circle, with the drum beat directing their movements. The tradition is passed from one generation to the next. All people (including non-Indian people) are welcome to St. Joseph’s Indian School’s annual powwow. It is a valuable and fascinating cultural experience for those unfamiliar with the rich traditions of our Lakota brothers and sisters. Registered contestants participate in the dancing until the “intertribal dance” is announced. At this time, all visitors attending the powwow take part. At a powwow, there are no spectators, everyone is considered a participant. 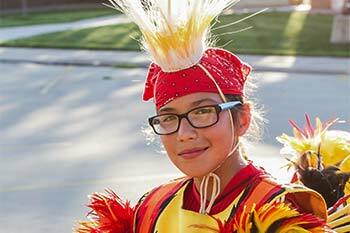 Register for St. Joseph’s Indian School’s 42nd annual powwow!